The white coat ceremony was initially established during the 1990’s by Arnold Gold, an American paediatric neurologist (Sandomer, 2018). Initially developed for medical students the ceremony has been incorporated by numerous medical, nursing, pharmacy and physician associate schools worldwide. The ceremony has evolved from a medical school event to mark the transition from ‘pre-clinical’ to ‘clinical’ training, to an initiation ceremony, inducting students into the world of thinking and learning about healthcare practice. Although there is some debate about the associated symbolism, it is argued that this ceremony still serves as a key event to emphasize the importance of humanism, whilst the ceremony also allows faculty to establish a framework for understanding the education that is to come, placing the student at the start of professional identity formation (Karnieli‐Miller et al., 2013). As opposed to uniprofessional white coat ceremonies it is suggested that an interprofessional ceremony could offer an opportunity to develop interprofessional socialization at an early point in their education. This early opportunity could assist students to move from a uniprofessional identity to an appreciation of professional and interprofessional roles, to break down barriers and to avoid perpetuating misconceptions developed prior to entry to higher education about their own profession (Khalili et al., 2013). To our knowledge there are no reports to date of such an interprofessional ceremony. The white coat ceremony originated in the Royal College of Surgeons in Ireland (RCSI) medical school during the 1990s as a result of a student union request for an informal occasion to acknowledge the introduction of students into the anatomy room and progressed to develop into a formal, significant event in the student calendar. The theme of professionalism was developed around the event, with a focus of inducting medical students into the world of thinking and learning about healthcare practice. In the early 2000’s new Schools of Pharmacy and Physiotherapy were founded at RCSI. Initial evaluations indicated that these students felt disconnected and separate from the medical students. At that point in time students from these new schools were not part of the ceremony and, prior to the establishment of the new schools, there were no interprofessional education initiatives in the undergraduate curricula. RCSI was motivated to develop a program of interprofessional education given it is a specialist healthcare institution combining the Schools of Medicine, Pharmacy and Physiotherapy forming the Faculty of Medicine and Health Sciences. Pre-qualification interprofessional education interventions have been promoted in order to enhance clarity about one’s own role and to gain an understanding of other professions (e.g. DiVall et al., 2014).The white coat ceremony was identified as a unique opportunity to support interprofessional socialization at the beginning of our students’ educational journey. The ceremony was designed to be appropriate to the earliest stage of the students’ professional education. This was in keeping with stage one of the framework for interprofessional socialization – breaking down barriers (Khalili et al., 2013). We recognized that the ceremony needed to be more than just bringing students together and consequently it was developed to ensure that student voice was central, while emphasizing institutional support for interprofessional collaboration. We ensured equal status among the group members, with students representing all schools showcasing their involvement in activities that emphasized cooperating towards common goals. Given that within RCSI all students have a teaching experience in the anatomy room, altruism and goodwill from patients and families consenting to be part of the student education journey is acknowledged, including the sacrifice made by family and those who donate their bodies for the benefit of healthcare education and research. Professional behavior to protect that privileged access is emphasized. For the final part of the ceremony students stand to make a shared interprofessional declaration; a student version of what will be their Hippocrates-inspired graduate declaration at conferring and another opportunity to understand shared values and professional goals. They commit to learn to be professional and to deliver high quality evidence-based care during their program, once again furthering interprofessional socialization. Evaluations indicate that the event is very positively received, it is inclusive and welcoming. Students have reported that across discipline sharing of personal insights and experiences has a significant impact. 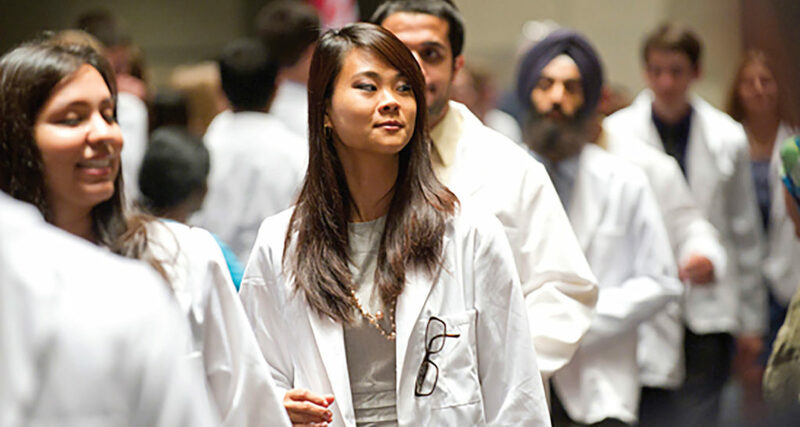 Additionally, alongside the excitement of starting a new program of study, the interprofessional white coat ceremony facilitates an initial understanding of the role of the patient in their training, the importance of team work and the responsibilities associated with being a health care professional. This is evidenced by a reflection from a pharmacy student, who noted: “I was surprised by the amount demanded as a student and professional. I first sensed this at the white coat ceremony; in putting on the coat I assumed the responsibilities that come with a professional career as a pharmacist”. From an institutional perspective this is the first step towards interprofessional socialization where healthcare professional students are introduced to each other and begin to recognize the need to learn together and begin to practice how to collaborate across professions. The aim is to develop a dual professional role where students appreciate the role of professional identity and interprofessional team work at a very early stage. In summary, our experience suggests that the initial power of the white coat metaphor has evolved within RCSI to deliver what is a novel inspirational Interprofessional Ceremony in the very first week of the students’ programs. To our knowledge this is the first time that such an approach has been reported. This initiative has offered our students an opportunity to develop interprofessional socialization at an early stage of their education. We have enjoyed reconfiguring this event to be a unique, inter-professional opportunity for new healthcare students and believe that this is a constructive approach to interprofessional socialization. Orna Tighe, Judith Strawbridge, Alice McGarvey Hannah McGee. Hoffman, S.J., Rosenfield, D., Gilbert, J.H.V., & Oandasan, I.F. (2008). Karnieli‐Miller, O., Frankel, R. M., & Inui, T. S. (2013). Cloak of compassion, or evidence of elitism? An empirical analysis of white coat ceremonies. Medical education, 47(1), 97-108.